This very cool box set is not your average anime and merges well with the horror genre in this very unpredictable series. Containing all 26 episodes, When they Cry definitely breaks the mould of big breasted Japanese school girls. The series is broken up into six chapters which revolve around protagonist Keiichi who has moved from Tokyo to the Japanese countryside in the small village of Hinamizawa. Initially Hinamizawa seems like the perfect country village, however as Keiichi Maebara discovers, there's definitely more to a book than its cover which is where the horror bubbles to the surface in this "sleepy" down. When Keiichi discovers that there have been a number of unexplainable deaths at a failed construction project, he decides to investigate, only to discover that the deaths and missing people may be responsible to the village's god called Oyashiro. According to the rumours in the village, this god has cursed all who had any involvement in the creation of this dam. As the six chapters are irrevocably linked, we discover that there are many similar themes such as the strange god that the villagers worship and that the townsfolk are not as innocent as Keiichi first believed, including his friends. Without spoiling the story too much, another one of Keiichi's friend Rena is the star of the final chapter who decides to take matters into her own hand when she discovers that her father's girlfriend has a very dark secret. Needless to say, the result is quite bloody and as per usual, things don't always go according to planned which is where the twists come into play. There is an element of black comedy in this series but overall, it's a very dark series with lots of elements of bloody horror and reminds me of a twisted version of Alice in Wonderland with its black Alice's. Video and audio quality for this series is above average and features sharp images, vibrant colours and some really cool animation. Containing both the Japanese and English soundtracks, both are quite good but you cannot beat the native tongue of this series. Unfortunately for special features, this collection lacks any oomph and only contains the textless opening/closing and some trailers. 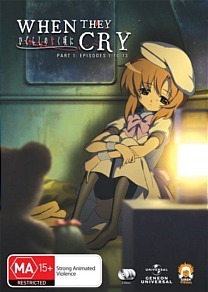 In the end, When they Cry is a very unpredictable series as it revolves around Keiichi and his strange world. There is an element of the Twilight Zone thrown into the mix as well, especially when the Watanagashi Festival comes around, once a year and like clockwork, murders and missing people. Needless to say when Keiichi does become involved in the town's business, some don't take kindly to strangers! Very deep!